From time to time interesting accessories come to our attention. The one discussed here is a very unusual one demonstrated to us by a constant Reader of 1967beetle.com, Guillermo Gonzalez, who lives in Puerto Rico. Guillermo has 3-1967 Beetles which he cherishes. One is a Deluxe (like the ones which came to the Continental USA) and one is a Standard (Economy) Beetle, such as ones which sold in Europe, and other geographic regions. The third is not operable at this time. Guillermo called this past Sunday to tell me how much he appreciates 1967beetle.com. I assure you that his comments were very welcomed! We love to hear from all of our Readers. He told me, too, that he is making a notebook of articles and technical tips. Several of our Readers have told us that they are doing the same. Guillermo and I talked for perhaps a half hour. During the conversation, he told me about his unusual Hazet Tool Kit. When I showed natural excitement, he promised to send a photo of it. After receiving the photo and reading about the contents, I sent the photo to long-time Reader, Jody Savageau for his comments. Jody is a researcher and has many resources at his fingertips. Jody wrote to say that the Hazet Kit was available for owners of ‘66-’67 Beetles and that it is different from ’65 and earlier kits. I have seen several versions of tool kits available. Notable ones were the Hazet and the VW Kits. In “the old days” EMPI put out a kit that was a copy of the two “official” kits. Nowadays, EMPI sells an inexpensive knock-off version which contains tools similar to the original ones. Regularly, vintage kits go at auction for extreme sums, some a thousand or more dollars. Even empty cases may sell for hundreds. Tools always are selling on eBay and thesamba.com, where buyers hope to find one more tool towards completing a kit. Thank you, Guillermo, for allowing us to enjoy your Hazet Tool Kit! What are the differences between the 66/67 and the earlier version? Im just shooting from.the hip here, but from the picture and the knowledge of our 67 being a wide 5×205 lug pattern and not having hub cap clips on our oem steel wheels. I assume that the tool kit would press into the wheel opening and seat the same way our hubcaps do. Just a thought. I have the VW (Hazet) tool kit, missing a few tools. Tools are extremely expensive if you want originals in good shape. I dont use the tools so much except for the speed wrench which nicely takes the lug nuts off. I do not know the differences of the kits from year to year. What is a “Traveller”? Is this also a kit that fits in the spare wheel? What are they worth? 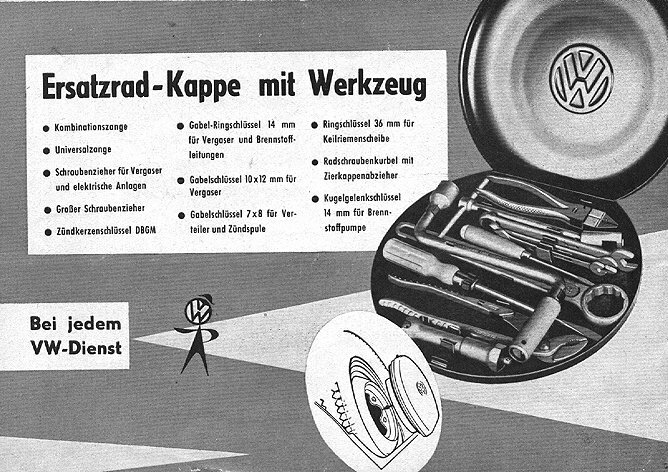 From a vintage accessories catalog, under Volkswagen Part Number 111 016 025 shows “spare wheel hub cap with tools” appears identical to discussed one, with exception of the large 36 MM? wrench. The one in this part number has opening on both ends, one smaller than other end. From accessories section in a Volkswagen Parts Manual from about 1962 lists same part number 111 016 025 and a photograph of it.. Also lists vw part numbers for a quantity of tools, not sure if the tools are related to this item however. 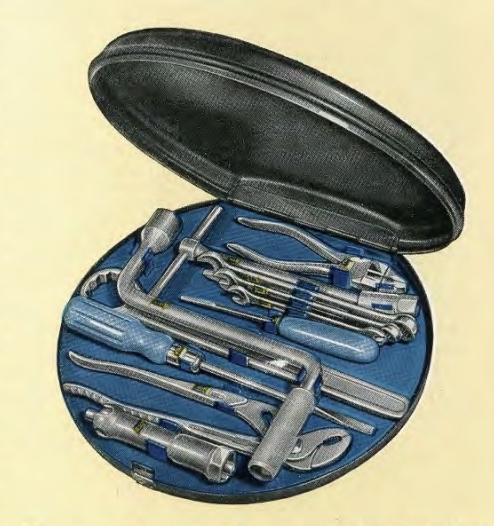 J. T. Garwood’s book states: The 1966-1967 spare tire center “hub cap” tool kit was not seen too often. Inventory; Open end wrenches 6mmx7mm, 8mmx9mm, 10mmx12mm, 13mmx15mm. Box/Socket wrench 17mm and 21mm. A valve adjusting tool, hub cap removal tool, feeler gauge, 9 & 1/2 inch universal pliers, test lamp. 150mm long screwdriver, 8mm blade, regular type, and 46mm long, 6mm wide Phillips. The inventory does not mention the lug nut speed wrench. Also Eric, the great photo of the kit above is very helpful to see what tools are included in the kit. However, do not see in the picture the valve adjusting tool, and the timing light mentioned in this thread. The part number 111 016 025. The 0 in 016 appears to signify an accessories in the way back times as it is part of the 9 numbered Volkswagen Part Number. All accessories part numbers in several vintage VW parts manuals are identified this way. 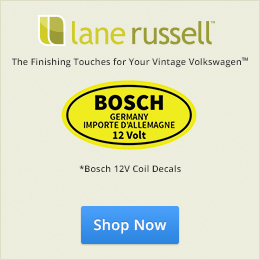 In a later Volkswagen Accessories catalog with part numbers from Volkswagen of America, Englewood Cliffs New Jersey, there is a combination of ZVW and the VW 9 numbered system to identify various accessories. Additionally some mechanical parts were identified using ZVP. With ZVW/ZVP there were still 6 numbers as in ZVP 121 145 which identified Bosch W 145 T 1 sparking plugs. Most likely/Perhaps the part number on these Hazet hub cab tool kits were on the original packing box, or attached via sticker. Garwood states that this part number was used from 1962 (perhaps earlier) through at least 1967 (but hints that the 1965 and below was perhaps different-maybe in the inventory) Whether changes were made in the inventory down through the years–? SAMBA has a long running discussion of Hazet tools of all sorts and varieties. Jay, I purchased my book from Mr. Garwood in distant past. I saw one somewhere in recent past, NOS for around $700. Yes…when my friend revealed that he had purchased Garwood’s 2 Volumes, I started laughing and laughing. Then, I told him what a single Volume was selling for–I’m not sure that he believed me! I couldn’t stop laughing–to have found these at a garage sale for a few bucks! You never know. You were fortunate to have purchased yours in new condition. And, to have had the interchange with Mr. Garwood. Thank you Jay for the Article of The 1967 Hazet tool kit. The tool kit for the 66 and 67 are unique for these years. Tools and placement of these are different from previous years. The 68 completely change and are other tools. The price varies by the condition of the tool kit. You can get over a thousand dollars. I have a couple of questions if you have time??? I just purchased a 67 beetle European model from the original owner. It has the 1300 engine in it. My questions are if I give you my VIN can you tell me what the original color and name of the interior is? VIN 117206630. Also because mine is a 67 European model would it have come with the hub cap tool kit or the tool bag tool kit? Thank you for your time. Hi.. I own a 1955 VW Beetle which I brought it from Germany in 1991. I’m also from Pueto Rico and I’m interested in contacting Guillermo Gonzalez.